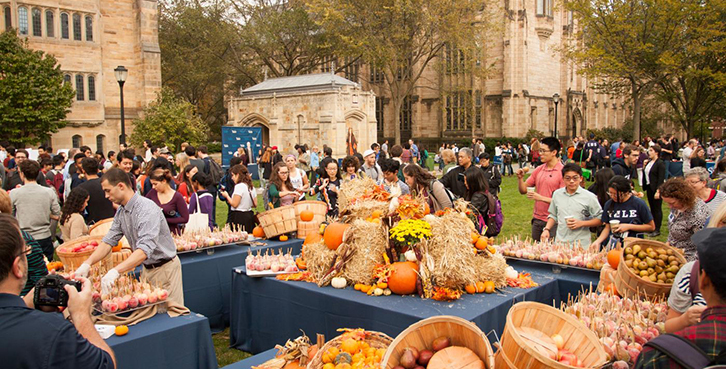 Join colleagues from across the university on October 9th for Yale Founders’ Day! This will include a celebration on Cross Campus from 11:30 to 1:00, drop in visits across campus with President Salovey, open houses and tours, and exciting virtual contests. Check the Founders’s Day website for details. That language is found in “An act for Liberty to erect a Collegiate School” enacted by the Connecticut colony in New Haven on October 9, 1701, marking the establishment of what has grown to become the Yale University of today. In the spirit of celebrations of previous generations, the presidential inauguration events of 2013, and in keeping with the spirit of encouraging everyone from all parts of campus to explore and embrace all that the university has to offer, Yale began a new tradition in 2014 with a “Founders Day” event for students, faculty, and staff, to be held annually on a day close to the anniversary of the 1701 founding.